If you aren’t using your bullet journal to help keep a cleaning schedule you need to start. Since starting my bullet journal cleaning schedules, my cleaning routine is faster, my house stays cleaner, and I haven’t forgotten any of those little once a month or so tasks like cleaning the fridge or oven. What I love most about keeping a bullet journal cleaning schedule is I can set up reminders in my daily or weekly spreads to stay on track with my cleaning. Additionally, I can plan cleaning for those monthly, every 3 months, and 6 month tasks. Let’s face it when you work from home, have a toddler, and have a pretty active lifestyle it can be difficult to keep track of everything you have going on. If you are like me a bullet journal or planner of some sort is an absolute necessity. Writing out my daily cleaning tasks means I can easily stay on top of all my cleaning. I simply look at my list each morning, complete my tasks before starting work, and check off my reminder. By tracking your cleaning you can also keep a pretty awesome schedule. If you know you have to vacuum and wash the floors you are less likely to schedule some other huge labor intensive task. Additionally, you can schedule out things like cleaning your fridge, sweeping up the patio, or changing your furnace filter so you never forget. By scheduling your cleaning you never forget to clean dryer vents, ovens, or gutters making your home safer in the long run. No two cleaning schedules are the same. What works for me may not work for you. I have cats and a toddler to clean up after, so I do the floors twice weekly. You may not have a toddler or any animals and may only need to do your floors once weekly. The trick to a successful cleaning schedule is to figure out what works best for you. I like doing my laundry all in one day. However, I know plenty of people who do laundry all weekend or even one load each day. 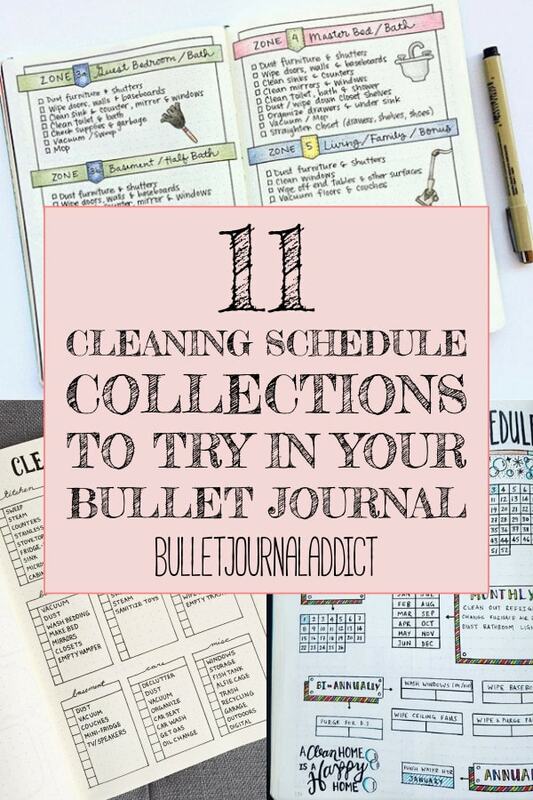 Let’s take a look at bullet journal cleaning schedules then you can plan and create your own. As promised, here's the second half of my #flylady routines. I actually had to force myself to finish this because I'm excited to move on to my next spread. I can't wait to see how it turns out! Of course, I'll share it when I'm done! ? Cleaning Spread Option I've had some fun creating different versions of spreads I use all the time. This is just a rough sketch in pencil, but I love the idea of the giant circles representing each day of the week. Underneath is the list of cleaning tasks to get done. Wouldn't this be fun all colored in? Now that you have some great ideas you can go ahead and create your own bullet journal cleaning schedule. First, write out a list of all your cleaning tasks. Mark which ones are daily tasks, such as cooking and dishes. Weekly tasks would include things like floors, windows, and bathrooms. Monthly tasks would be cleaning out your fridge and vacuuming bedding and furniture. Now you can start creating your bullet journal cleaning schedule. Use the pictures above as inspiration for your own. Or create a completely different spread all together. Make sure you customize it to you. Now add reminders in your weekly or monthly spreads. Now you will stay on track with your cleaning tasks as well as all future tasks. Do you use a bullet journal cleaning schedule? Do you have a cleaning schedule? Let me know in the comments below. Do you have bullet journal spreads you would like shared? Email them to [email protected] and they may be featured on an Instagram post and/or to the blog. Please leave your IG Username so I can tag you in the posts. Follow me on Pinterest for more like this and pin this to your Bullet Journal boards. Hi. My cleaning spread is in here but for some reason, is not linked to my IG @craftydeesigns. If possible, could you link it. Thank you! Mine is the William Hannah leather notebook between @librariana and @blue_sky_design. Thank-you for bringing that to my attention. It’s all fixed now and both picture and source link go back to you. You have a great Instagram feed and I look forward to seeing more BuJo ideas from you in the future. Love these ideas, thank you! And love the suggested products, just followed the links and ordered them all. I’m glad you enjoyed the post. I researched and use those products myself let me know how they work for you.